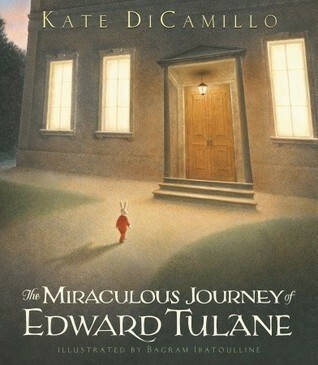 The Miraculous Journey of Edward Tulane is a novel written Kate DiCamillo and illustrated by Bagram Ibatoulline. Abilene gets a china rabbit from her grandmother as a gift and said rabbit – Edward Tulane – quickly becomes her most treasured possession. So it’s no surprise that the naturally vain Edward becomes even more convinced of his own perfection. But then he falls overboard from the ship Abilene and her family are vacationing on. This is the start of a long and arduous journey for Edward. The Miraculous Journey of Edward Tulane is a touching book for all ages that doesn’t shortchange any age group. It really is a beautiful read. The Miraculous Journey of Edward Tulane is an interesting book in many ways. For adults like me, the book doesn’t really offer any surprises, but it’s the kind of book that you read for the emotional pay-off and for that, the plot does have to progress the way it does. And I cried appropriately at it. But I can also see this book being read to children. And I’m sure that they will also be touched emotionally, but that the complexity of the themes the book touches on would also be a great opportunity for discussion and growth alongside Edward. And I’m sure both children and adults with love the beautiful illustrations. In any case, despite Edward’s unlikeable beginning, he stole his way into my heart and I felt with him – which I do think would happen to anybody who read the book or had it read to them. Although in the end, it was Bryce who broke my heart (as he was set up to do). The thing that stood out to me about the story, my moral take-away, if you will, was that people really have a hard time letting beautiful, comforting things be, at least for others, but how important it is to have them. This entry was posted in books, female writer and tagged Bagram Ibatoulline, Kate DiCamillo, The Miraculous Journey of Edward Tulane by kalafudra. Bookmark the permalink.